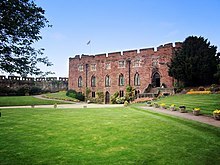 ^ a b c "Shrewsbury Castle and Shropshire Regimental Museum | Original Shrewsbury". originalshrewsbury.co.uk. Retrieved 2018-06-14. ^ a b c "Charles Darwin: His Life, Work and Shrewsbury | Original Shrewsbury". originalshrewsbury.co.uk. Retrieved 2018-06-14. 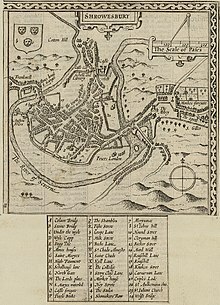 ^ "About Shrewsbury | Original Shrewsbury". originalshrewsbury.co.uk. Retrieved 2018-06-14. ^ "Shrewsbury Abbey | Original Shrewsbury". originalshrewsbury.co.uk. Retrieved 2018-06-14. 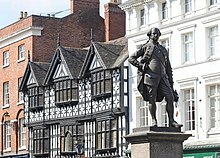 ^ "The Mayor of Shrewsbury | Shrewsbury Town Council". www.shrewsburytowncouncil.gov.uk. Retrieved 2018-06-14. ^ "Contact us | Shrewsbury Town Council". www.shrewsburytowncouncil.gov.uk. Retrieved 2018-06-14. ^ "Wyle Cop | Original Shrewsbury". originalshrewsbury.co.uk. Retrieved 2018-06-14. ^ "Darwin and Pride Hill Shopping Centres | Original Shrewsbury". originalshrewsbury.co.uk. Retrieved 2018-06-14. ^ "The Quarry Park | Original Shrewsbury". originalshrewsbury.co.uk. Retrieved 2018-06-14. ^ "The Gateway | Original Shrewsbury". originalshrewsbury.co.uk. Retrieved 2018-06-14. ^ "Severn Bridges | Original Shrewsbury". originalshrewsbury.co.uk. Retrieved 2018-06-14. ^ "The Bellstone, Shrewsbury | Original Shrewsbury". originalshrewsbury.co.uk. Retrieved 2018-06-14. ^ Laity, Paul (2007-11-10). "A life in writing: Mary Beard, Britain's best-known classicist". the Guardian. Retrieved 2018-06-14. ^ "Shrewsbury Flower Show | Original Shrewsbury". 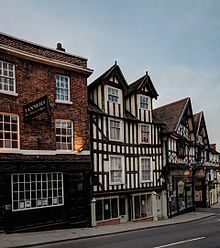 originalshrewsbury.co.uk. Retrieved 2018-06-14. ^ "Shrewsbury Folk Festival | Original Shrewsbury". originalshrewsbury.co.uk. Retrieved 2018-06-14. ^ "DarwIN Shrewsbury Festival | Original Shrewsbury". originalshrewsbury.co.uk. Retrieved 2018-06-14. ^ "Old Market Hall | Original Shrewsbury". originalshrewsbury.co.uk. Retrieved 2018-06-14. ^ "Theatre Severn | Original Shrewsbury". originalshrewsbury.co.uk. Retrieved 2018-06-14. 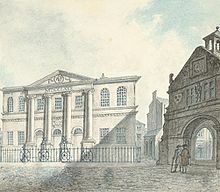 ^ "Shrewsbury Museum and Art Gallery | Original Shrewsbury". originalshrewsbury.co.uk. Retrieved 2018-06-14. ^ "Shrewsbury Biscuits | Original Shrewsbury". 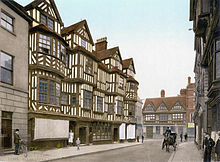 originalshrewsbury.co.uk. Retrieved 2018-06-14.